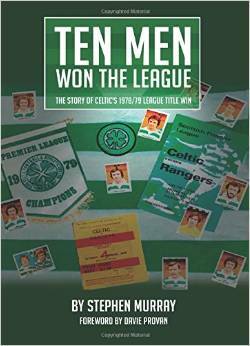 The 1978-9 season was a truly unique one and this book superbly captures all the drama – and fascinating detail – of an historic episode in The Celtic Story. It is unusual for a football book to be this interesting, engaging and authentic and it is an excellent example of supporter self-publishing. Often with such books either the writing quality, structure or presentation can be of dubious quality and the absence of an editor is all too evident but here Stephen Murray has produced a book which is professional in standard – and an absolute joy to read. 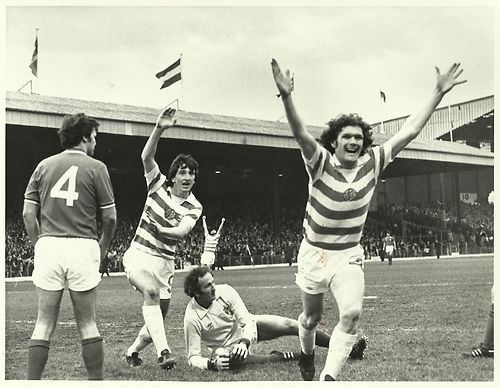 You might assume (if you are of a certain Celtic-supporting vintage) that there was little you didn’t already know about the glorious 4-2 season. Yet, from the wreckage of Jock Stein’s last season in charge at Celtic Park, through the notorious Winter of Discontent up until the point where Celtic were 2-1 and Johnny Doyle down to our former greatest rivals in the last game of the season with the championship slipping away, this book throws up one revelation after another: Celtic’s transfer targets in Billy McNeill’s first season in charge included Motherwell’s Gregor Stevens and Willie Pettigrew; midfielder Ronnie Glavin was sent to Barlinnie during the course of an insurance fraud trial; Celtic had four goals disallowed in one game (v Montrose); you could still buy tickets from the club on the morning of the 4-2 game itself. The book is a treasure trove for Celtic fact-fiends and the detailed research on display is exceptional. The structure adopted is what helps the story – and atmosphere – of the season build and build ‘til its incredible conclusion. There’s a report of every game played and the reader is taken from the depths of a 4-1 defeat at Pittrodrie to a hard fought 4-3 win at Fir Park, the club’s embarrassing foray into the Anglo-Scottish Cup due to the absence of European football, the riot at Burnley (where the English fans chanted ‘Argentina’ at the away support in reference to that summer’s disastrous World Cup – how the times have changed! ), Jock Stein’s testimonial match against Liverpool where a wonderful 62,000 crowd turned up to show their appreciation for the great man through to Rangers’ desperate attempts to avoid a game against Celtic going ahead at Hampden soon after a debilitating European tie. Everything of note that season is touched upon between these covers. The authenticity comes from the author’s ability to recall or unearth details that only a genuine supporter would know or perhaps find of interest. That is how we are reminded of the Celtic fans chanting “The Huns are feart to play us” after the Hampden call-off debacle or the fans staying on after that 4-1 defeat away to Aberdeen to show they still backed the team – a show of the kind of support that Billy McNeill felt helped lift the players all the way to the title in that ultimately gruelling season. The author also recalls the significance of the last time the Celtic support would occupy the vast ‘Celtic End’ terrace at the old Ibrox Park (in a game against St Mirren whose own stadium was under reconstruction) before it became an all-seater stadium, the scene of many fierce battles and cherished moments of celebration for the Celts on and off the field. These kind of memories are particular to fans, take you right back to certain times and places and also demonstrate that the author knows exactly what it was like to stand on those terracings and sing those songs. The book also rekindles a vision of an entirely different era in football from now without falling into the nostalgia trap that many seem to. This was a time when you didn’t need to buy a ticket in advance for most games, when most stood on terracing open to the elements and you could take unlimited amounts of alcohol into the ground with you – often resulting in bottles being sent flying towards the pitch when fans decided to vent their spleens. Aberdeen players were genuinely in fear of their safety during one controversial fixture at Celtic Park. This was also a time when commercialism was just creeping into the game and club badges had started to appear on jerseys alongside sportswear branding and sponsorship of individual matches began to take off. Margaret Thatcher came to power during the course of this season and monumental changes in society – as well as football – were just around the corner. 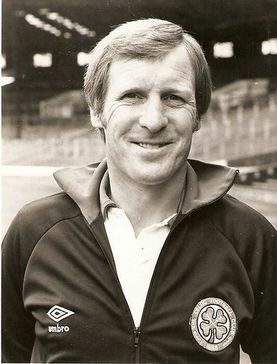 Ultimately though it is about the battle between three managers who had just taken the reins at their clubs – Billy McNeill, John Greig and Alex Ferguson in addition to Dundee United’s Jim McLean – for one of the most competitive Scottish league campaigns in history. New faces at Celtic Park included Davie Provan and Murdo McLeod while Roy Aitken and Tommy Burns were emerging as key figures on the park. McNeill moulded them into a compact, fighting unit who remained focused on the prize despite an unimaginable fixture back log caused by months of near-Arctic conditions. This is their story and the pressure builds incessantly towards 21st May 1979. We know this because the author has been able to secure interviews with most of the Celtic team of the time – and even Gordon Smith then a striker with Rangers. The match played between the two Glasgow clubs that evening at Celtic Park is a rare example of “winter takes all” in the Scottish game. Whereas there have been a few examples in recent decades of the title being decided on the final day of the season, it hasn’t been the case that the two teams in pursuit of the title were facing off against each other. The mere thought nowadays would be enough to induce immediate diahorrhea among Scotland’s politicians, media and (especially) police chiefs. This book builds an intense picture of the pressure felt on and off the field as well as the importance of the outcome to players, fans and management teams alike. Unsurprisingly, the final game merits a whole chapter to itself. This impressive book captures everything from that season and that game with the flair of a Provan run, the commitment of a Danny McGrain tackle and the punch of a Murdo McLeod pile-driver (and fortunately it is not bloated like Peter Latchford’s belly was at the time). It is a book that I expect to return to again and again because of the unique story expertly told as well as the statistics, pictures and quotes from those directly involved on the pitch that help bring it to life. The legend of the “Ten Men” and the “4-2 game” has never been told as well as this before. The fanzine can also be bought on the day of the game at the Glasgow Programmes stall behind the Lisbon Lions Stand and from various sellers around the main entrance points to Celtic Park. Also available from Calton Books on London Road and Casa Rebelde in Dublin. 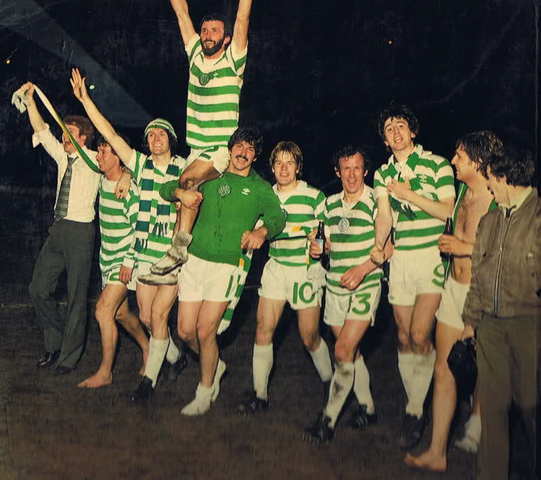 My memory of that night was not knowing any score or updates until David “Kid” Jensen announced near the end of his Radio 1 show that Celtic had won 4-2 and the league. How times have changes relating to finding out scores. My memory of that night was the Celtic end vibrating. I lost my mate , but no offence did not care. many growing men in tears of joy will never forget. Think we would have wone with 8 men.